The Harvard Club of the UK is pleased to invite you to the Tate Modern for a private lecture on the Alexander Calder exhibition, Performing Sculpture, followed by a viewing of the exhibition. Dinner can be booked at the Tate Modern Cafe following the exhibition. 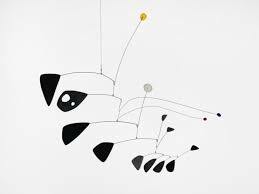 Alexander Calder, known to many as ‘Sandy’, was an American sculptor from Pennsylvania. He was the son of well-known sculptor Alexander Stirling Calder, and his grandfather and mother were also successful artists. Alexander Calder is known for inventing wire sculptures and the mobile, a type of kinetic art which relied on careful weighting to achieve balance and suspension in the air. Initially Calder used motors to make his works move, but soon abandoned this method and began using air currents alone. Alexander Calder: Performing Sculpture will reveal how motion, performance and theatricality underpinned Calder's practice. It will bring together major works from museums around the world, as well as showcasing his collaborative projects in the fields of film, theatre, music and dance.